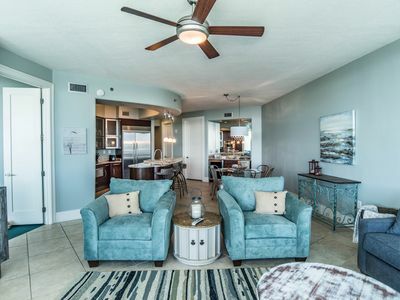 Newly renovated and spacious condo with costal décor - meticulously clean - has spectacular panoramic views from the oversized balcony, master bedroom and living room. 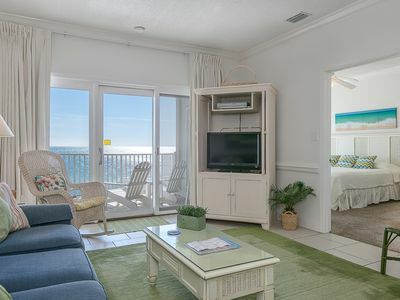 Private very large beach - The kitchen is oversized and is a perfect gathering spot for family and guests! 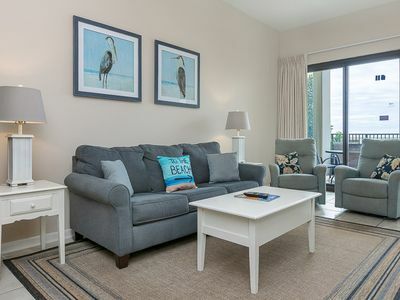 The unit's spacious layout is definitely a wonderful location for family and friends. 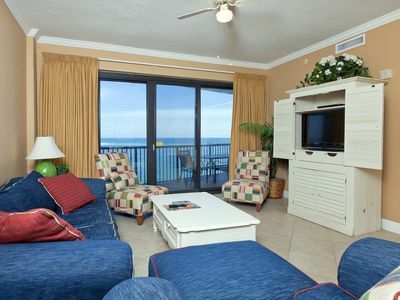 Our condo is a large 3 BR unit however, we will rent as either 2 or 3 bedroom. 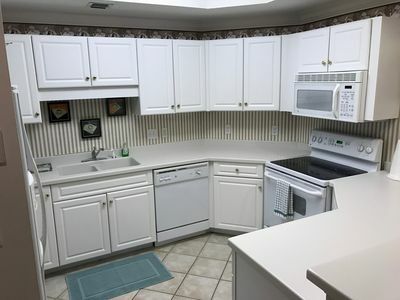 (Contact owner for 3BR pricing). All gathering rooms are large and spacious. 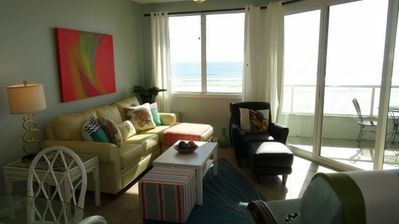 The condo includes: a keyless entry, free wifi, an updated, fully equipped and organized kitchen for ease of use. 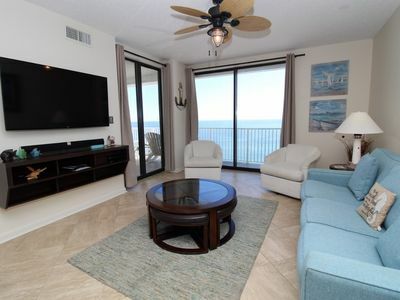 A large screen HD Smart TV in living area and smart TVs in each bedroom allowing you to stream your Hulu, Netflix, HBO, Amazon Prime, etc. accounts. Also, the condo features a queen sleeper sofa, updated master bathroom with walk in shower and tub/shower in bath next to guest bedrooms. 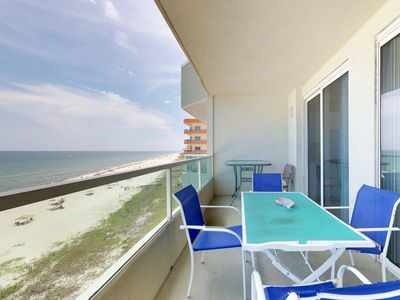 A dining table with 6 chairs, a bar with bar stools, and kitchen island with 2 barstools allow for plenty of seating - also table with 6 chairs on balcony for "dining with a view!" 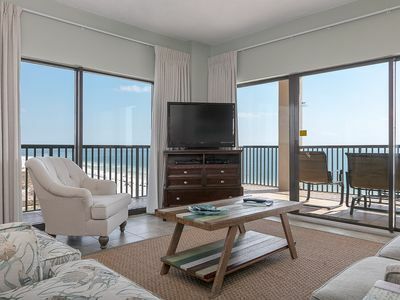 Several features most guests appreciate are hair dryers in each bathroom, upgraded Dish network which includes sports and movie channels and ceiling fans in each room. 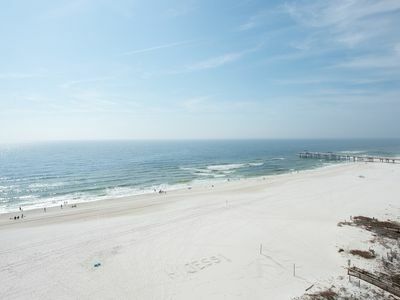 The Palms offers activities for everyone to enjoy: having your morning coffee on the balcony, swimming in the waves, taking a dip in the outdoor or indoor (heated) pool, surf fishing, shell collecting, enjoying the beach while exercising in the ocean view fitness facility, tennis, sauna, night-time crab hunting, or just enjoying a long walk on the beach getting sand between your toes... there's something here for everyone! 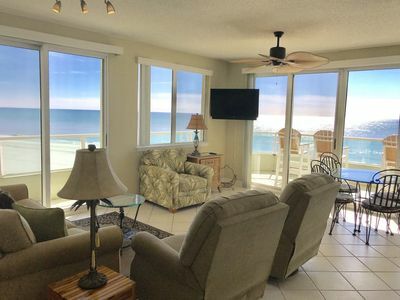 Also, venues with live beach music, marinas to go dolphin watching or fishing, and great restaurants are just minutes away. 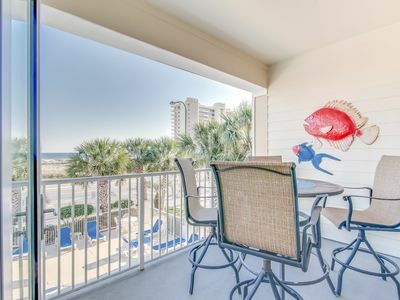 The area includes some of the best restaurants on the gulf coast, world-class golfing, the Naval Air Museum (home of the Blue Angels), zip lines, wonderful coastal art complex where you can throw pottery, paint, watch artists at work blowing glass are just minutes away! 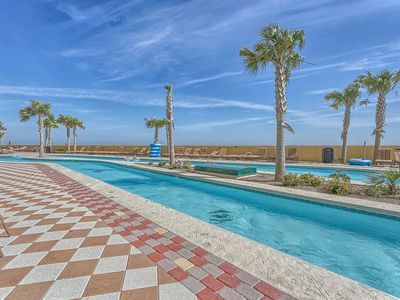 A FUN water park, NEW amusement park, miniature golf, outlet shopping, and megaplex cinemas are close by as well. Check out the Wharf which has shopping, great restaurants, cinema, ferris wheel, live music - all just minutes away. Mornings can include watching a beautiful sunrise, while listening to the peaceful sounds of the ocean waves, and watching the fishermen sail out for a day on the deep seas. 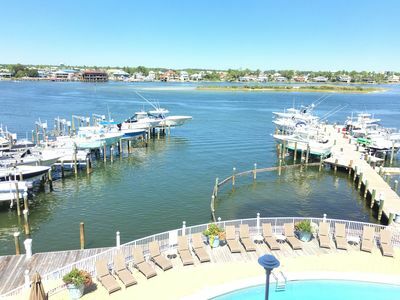 Whether you are watching the dolphins swim, the Blue Angels take a practice flight, para sailing above the ocean, or boats sailing on the open seas, you are sure to find serenity with this little slice of paradise. 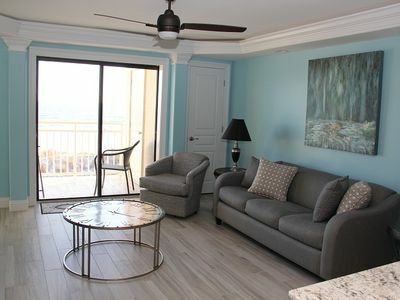 Our posted prices are competitive for 2 bedroom units, however if you are interested in renting all 3 bedrooms please contact the owner for pricing. We do offer military and first responder discounts - ASK! VBRO requires payment through this site for new reservations unless you already have an account with the owner directly . 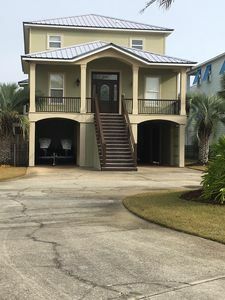 Please call or email today to reserve this "Little Slice of Paradise"! We love this place and work very hard to exceed your expectations!! 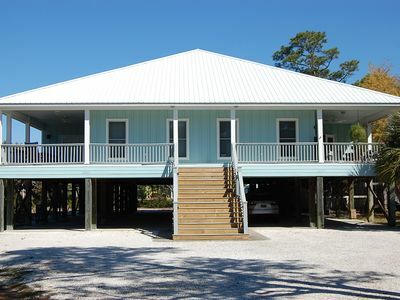 Boat Slip with Lift, Paddle board, and Large Private Deck! 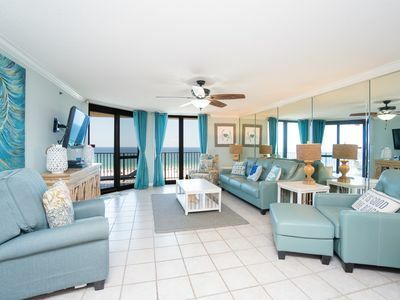 Shoalwater 1204-Beach Front Views from Large Terrace with Luxurious Interior! 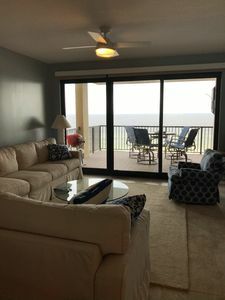 Pet Friendly Gulf Front Condo! | Beautiful Views! 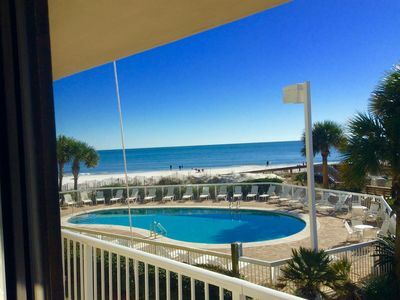 Central, Gulf view condo w/ balcony & shared pool - beach across the street!